A 26-year-old refugee from Eritrea died when she was hit by a police car responding to a 999 call. The YMCA St Paul's Group confirmed the woman had been a resident at YMCA Walthamstow for the past 18 months. It said it was "shocked and saddened" by her death and was supporting its residents and staff with counselling. Gilbert James, 44, who lives on Forest Road, said he "heard a loud bang and police sirens". When he came out to investigate he said he "saw the person lying on the floor" and the police car windscreen "completely smashed". Pav Kaur, who lives nearby, said there was "a very sombre atmosphere" in the area. Police are trying to trace the woman's next of kin, who are thought to live outside the UK. 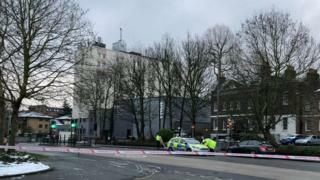 The car had been responding to reports of a man threatening members of the public, Scotland Yard said. By the time officers arrived the man had left the scene. The Independent Office for Police Conduct (IOPC), which has launched an investigation, said "two people apparently walked into the road" as the police vehicle travelled along Forest Road. "One of the pedestrians was struck and sadly passed away," the IOPC said. Forest Road reopened shortly after 09:00 this morning and traffic has been flowing through like it would on any morning. The remnants of blue and red police tape attached to a few lampposts are the only sign of what happened. Residents of the YMCA where the victim was staying believe she was Eritrean. They described seeing people looking visibly upset and crying this morning during breakfast. One resident told me the situation many of the residents living here are in meant they became close friends, which was why so many were shocked and saddened. The Met said it had referred itself to the IOPC and informed its own Directorate of Professional Standards. There were 29 police-related fatalities on the roads in 2017-18, of which 17 were "pursuit-related", according to IOPC and eight involved police vehicles responding to emergency calls. Five fatalities involved police vehicles hitting pedestrians while responding to an emergency call and one pedestrian death related to a pursuit. In the previous year, 2016-17, were there 32 fatalities on the roads involving the police. Of those, 28 related to pursuits and none involved police responding to emergency calls. Walthamstow MP Stella Creasy said the woman's death was "terrible news".